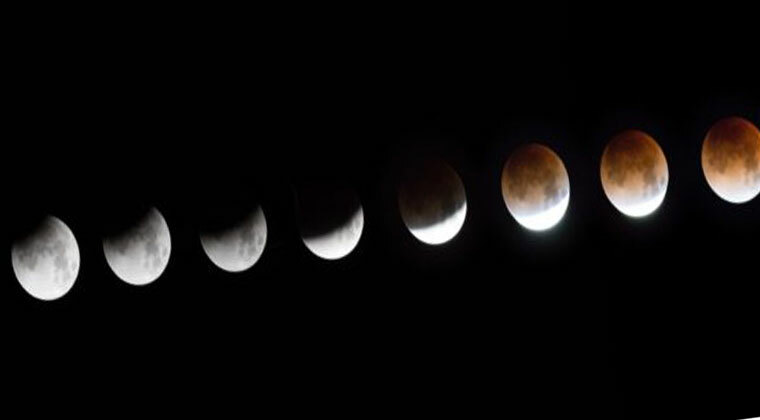 The longest total lunar eclipse of the 21st century would occur on July 27, with the celestial spectacle visible in its entiretyfrom all parts of India. The eclipse will last for 1 hour and 43 minutes, giving viewers a wonderful opportunity to experience the happening, according to Debiprosad Duari, Director, Research & Academic, M.P. Birla Planetarium, Kolkata. It will be preceded and followed by partial eclipses lasting more than one hour. The partial eclipse of the moon will start around 11.54 p.m. Indian Standard Time, with the total eclipse begining at 1 a.m. on July 28. “The greatest eclipse, when moon will look the darkest, will be at around 01:52 a.m. and the totality will continue at 02:43 a.m. after this period the moon will remain partially eclipsed till 03:49 a.m. of July 28,” Duari said in a media release. Earlier this year, there was a total lunar eclipse on January 31. For a total lunar eclipse of a long duration to occur, the moon has to pass through the central part of the Earth’s shadow. The previous total lunar eclipse on January 31, lasted 1 hour and 16 minutes when the moon passed to the south of shadow’s centre; and the next total lunar eclipse on January 21, 2019 will be only for 1 hour and 2 minutes because it’ll pass to the north of the shadow’s centre. Late at night on July 27, the full moon will be near its apogee, the farthest point from Earth in its orbit around Earth, and it will be the smallest full moon of the year. The full moon will plunge deeply into the Earth’s shadow on the night of July 27-28. The distance of the Moon from Earth just before the eclipse will be around 406,223 km. Depending on atmospheric conditions, this could be an especially dark total lunar Eclipse. The longest possible total lunar eclipse is 1 hour and 47 minutes. In this case, the centre of the lunar disk aligned almost perfectly with the centre of the Earth’s shadow. During a total lunar eclipse, the moon’s disk can take on a dramatically colourful appearance from bright orange to blood red and more rarely dark brown to very dark gray depending upon the part of the Eartha¿s shadow it will be passing through. Lunar eclipses are completely safe to view with the naked eye. “No special filters are required to protect your eyes like those used for solar eclipses. One does not need a telescope to watch the eclipse, although a good pair of binoculars will enhance the experience,” Duarisaid. An eclipse of the moon takes place only at full moon. Whenever the sun, earth and moon come in a perfect straight line, as the sun’s rays falls on the earth, its shadow falls onto a patch of space, and only when, moon enters that patch of shadow can we see a lunar eclipse. The shadow is actually composed of two cone-shaped parts, one nested inside the other. The outer shadow or penumbra is a zone where the earth’s shadow is partial and blocks some, but not all of the sun’s rays.